We may think of stir-fries as a quick cooking method over very high heat, but there is actually another step before the ingredients hit the wok. The best Chinese stir-fries begin with a marinade, allowing the meat, chicken, or seafood to absorb a bit of flavor before it is cooked with the vegetables. You will notice most stir-fry recipe ingredient lists can be broken down into a marinade, a sauce, and the meat and vegetables. If you have this marinade under your belt, you can toss together an authentic Chinese stir-fry in no time—perfect for a busy weeknight. This easy marinade recipe is great with a beef stir-fry and works well with 3/4 to 1 pound of sirloin or ​round beef, cut into thin slices. The combination of oyster sauce and sugar goes nicely with several recipes. To a bowl with the thinly sliced beef, add the ingredients, one at a time. Gently mix to combine and let marinate for 15 minutes, or as the recipe instructs. This marinade will definitely make for a better stir-fry, but if you don't cut the beef properly, the meat could ruin the dish. 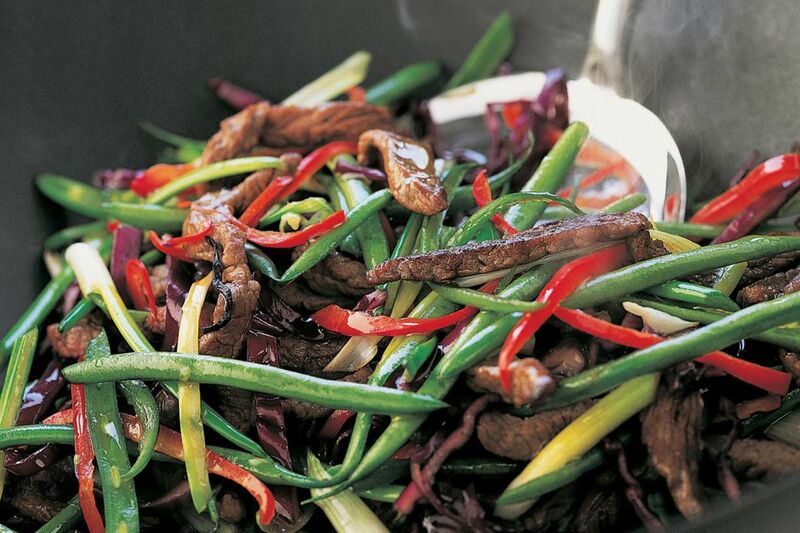 There are a few tips when slicing beef for stir-fry. First, when cutting the beef, it is important to slice it across the grain, which helps tenderize it. To determine which direction the grain is, look at the top of the piece of meat and see if the muscle fibers are running vertically or horizontally. Then cut perpendicular to that line. Second, you want to be sure to slice the meat thinly and into uniform-size pieces. This can be challenging if the beef is room temperature, so you might want to pop it in the freezer for 20 to 30 minutes first. This will make it much easier to create thin pieces of beef that are all the same size. Once you have your beef marinating, you can prep the rest of the recipe's ingredients. When you are all set and ready to cook, remove the meat and discard the marinade.